Do you want to build your own fishing lures? There are some excellent fishing lure ebooks that can teach you everything you will need to know about making great fish attracting lures. Ebooks about making fishing lures can be a great resourceful guide to take you through the process from start to finish. You'll find out everything you need to get started, and learn how to create your own custom baits. You can easily learn how to make top notch wooden fishing lures and very effective soft plastic lures. Everything from top water plugs, swimbaits, spinners, and jigs to good ol' plastic worms and creature baits. They'll be durable enough to withstand tough conditions and to hold up to use for both saltwater and freshwater fishing. You'll be able to make as many as you want. It's a fun and easy hobby to get into. You can even give them away as gifts to other fishermen, and use them yourself to go after those trophy sized fish. Learn How To Make Fishing Lures, Spinners, Plugs, Spoons - Bass, Crappie, Trout, Muskie, Salt & Freshwater Water - In Minutes Using This Guide! 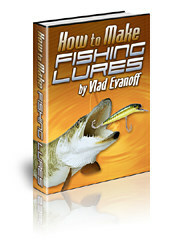 Have you read any of these fishing lure ebooks? Or any other fishing books or magazines? Or would you like to recommend a cool fishing book to be listed on this freshwater fishing website? Share your fishing book reviews here.